Today is Alex’s Fun and Games blogfest. If you don’t know Alex, take a minute and check out his blog. He reviews movies, keeps us updated on new technology, and is very supportive of his fellow bloggers. We’re supposed to list our 3 favorite games and why. I, of course, bent the rules a little bit……. 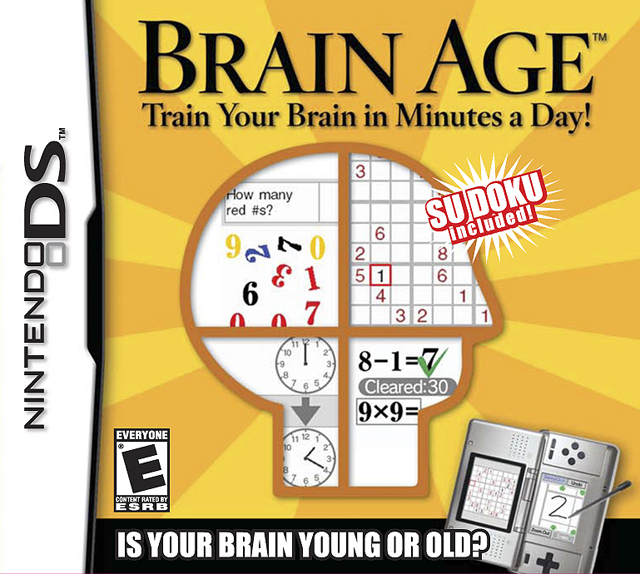 Oh my gosh, if you’ve never played this game, you really should check it out! 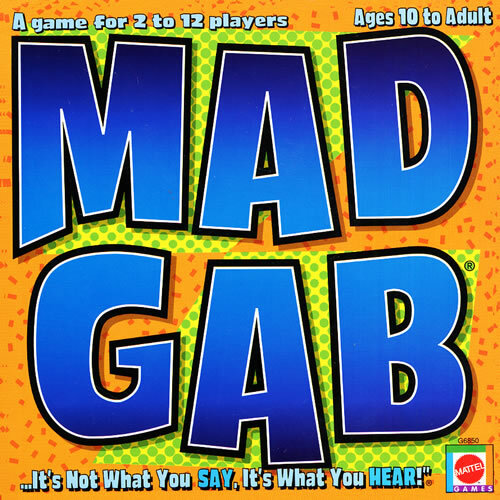 On the rare occasions that my family can get all together, we play this. It’s totally hilarious and it’s fun trying to figure out what’s really being said. 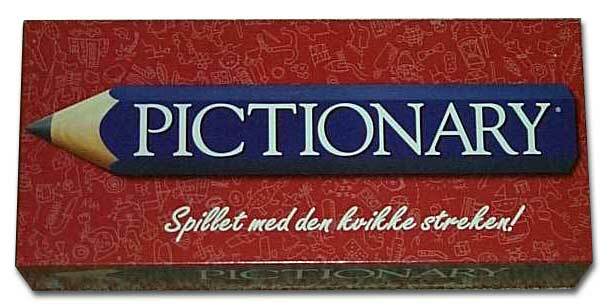 Pictionary is another game we play when we’re all together. It’s challenging and fun and sometimes, our talents are um, questionable. We’re terribly competitive, which makes for lots of fierce hilarity. A hint: you can go to Lowe’s and have shower board cut. Makes for an awesome dry erase board for a fraction of the cost! Now, here’s where I bent the rules a little. Those are games I like to play with others. Sometimes, though, I need to just de-stress. The only game I ever play on Facebook anymore is Country Life. The crops never wither and die! And it’s pretty mindless, so…..
or to just help get me out of my head when I need it….. 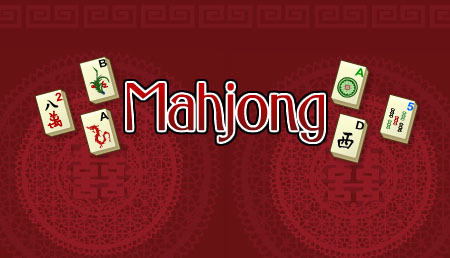 I love, love, love Mahjong!!!! Honey bought me a PC disc with all sorts of variations of the game and it’s likely my favorite. 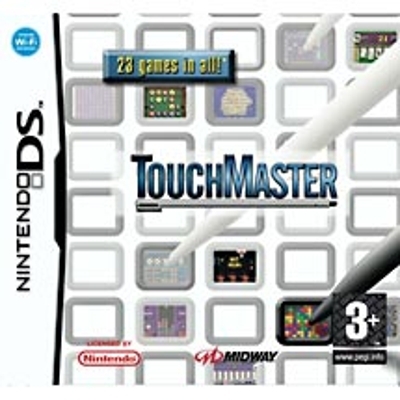 I also have it on my DS, but it times out on me, hee. So, those are a few that I love. When I was little, we played I Spy and Punch Buggy. Owww! TicTac Toe? Hangman? 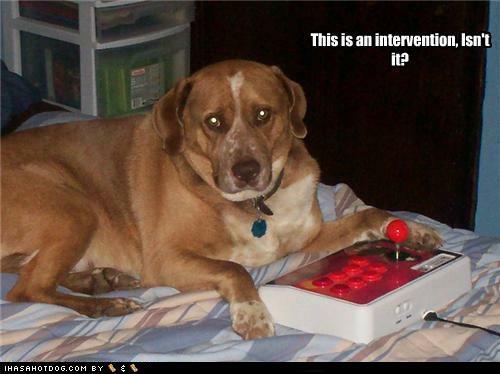 Global Thermonuclear War? Wow, yesterday was a very long, but fun day. The class, I’m happy to say, was really fun. And active. I was ready for bed as soon as I got home……but the day wasn’t over yet. Honey’s knee acted up at the cookout, but he still ‘whooped’ Furby at ping pong. And I…..I managed to actually get some writing done. On my favorite wip! Yay!!! I don’t know if it was because it was so late, or because I was so tired, but when I read the last few pages I’d written (some time ago, mind you) I couldn’t remember writing them. Strange. It’s chilly, wet, and gray outside. My favorite kind of day in the whole wide world. Gonna fly through a little housework, get a shower and do a few errands, arrange for some face time with Brother, Pooh, and Squirmy, then I’m gonna write. For a few hours I hope. I will also be coming around to see what you all are up to. This will be the giant push before A to Z starts. Which reminds me. I’ve got some awards to pass around…..gotta get on that before the first! I’ve mentioned before that my mom and I had a complicated relationship. As an adult, I grew to understand that there were two major contributers to our often uneasy and sometimes brief truces. Her mother, my grandmother was a real piece of work and never passed up an opportunity to run anyone into the ground, especially Mom. The other thing I didn’t learn about until a few months before she died. She suffered from severe, chronic depression…. Needless to say, my life growing up was ‘interesting,’ but I survived. When I was 18, I moved out on my own, and we grew to be friends. Good friends. And I will always be thankful for that. There are several things in my life for which I have to give Mom credit. 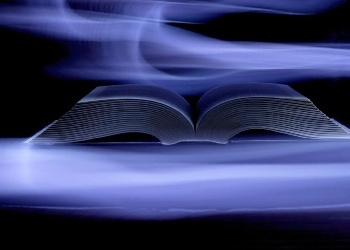 My passion for reading. My love of Christmas. My creativity. My passion for learning. And my endurance. One of the biggest things she instilled in me was the habit of giving. Mom always told us that whenever we had the opportunity to give, we should do it. 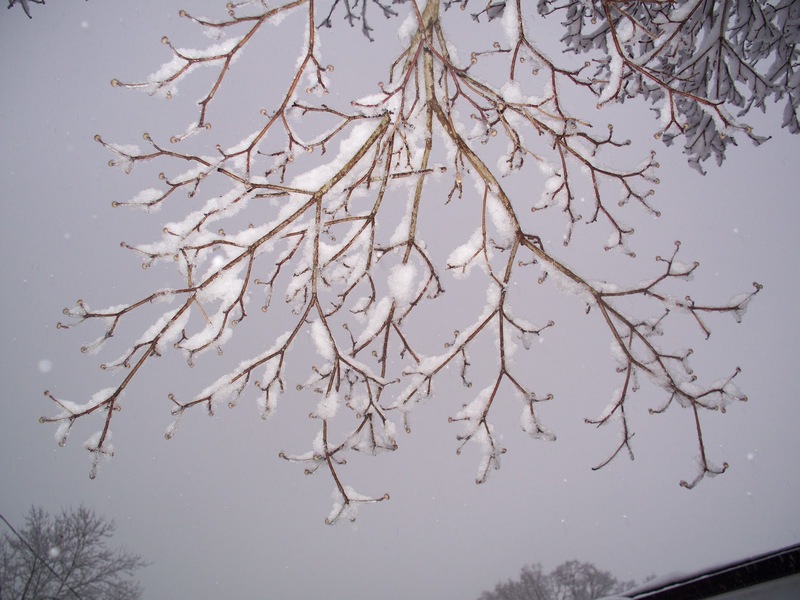 She reminded us that at some point, we may need to receive…. So, I give. I contribute. I assist. And it gives me joy. Real joy. For the record, I have had to be on the receiving end a few times. It’s a difficult place to be, but, it’s also providing someone else the opportunity to be a giver. Yeah, it’s still not a fun place to be, but I am extremely thankful that someone took the time and resources to give…to me. Recently, I reached and exceeded 100 followers. Something I never even dreamed of! 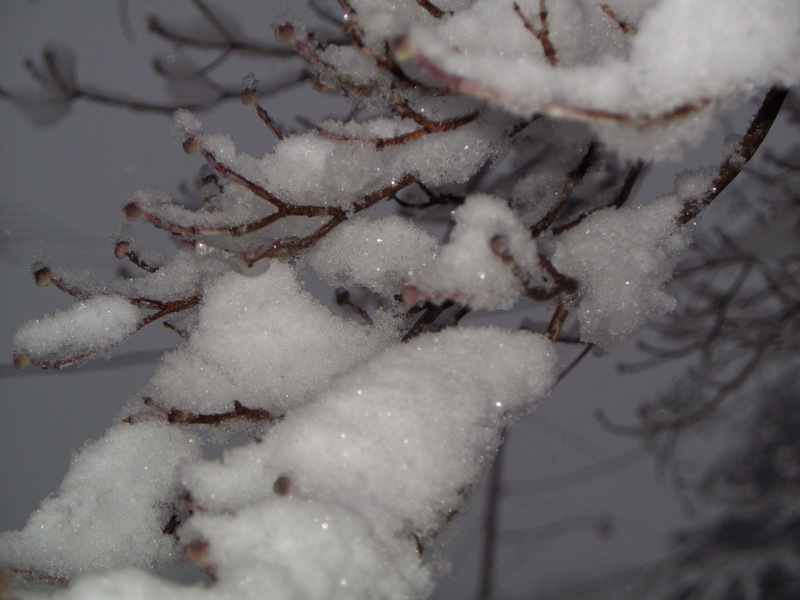 In February, my blog will turn 1 year old – on my husband’s birthday. In honor of Mom’s birthday, my Honey’s upcoming birthday, the first anniversary of my blog, and reaching 100+ followers, I’m having a little giveaway. I wanted to do it at Christmas, but I thought of how hard it is for some people at this time of year. So many get the blues….and I wanted to offer some cheer. I also wanted to showcase a few fellow bloggers who are are also artists in some form or other. Take a few moments to check them out as you read through the rest of this. I suppose I could call this giveaway A FEW OF MY FAVORITE THINGS…..
Charlene is a fellow blogger who creates beautiful paintings. She also creates digital copies of her originals and makes art for hanging, bookmarks, and canvas covers for checkbooks, etc. I got two of her calenders for myself, and two to give away. This one is the Creeper Calender. You can get a better look at it here. This set includes: the calendar, a votive holder from Yankee Candle (and a tealight), a mini-bookmark from Charlene, a mini stapler, mini post-its (because I’m not writing on my calendar-it’s too pretty! 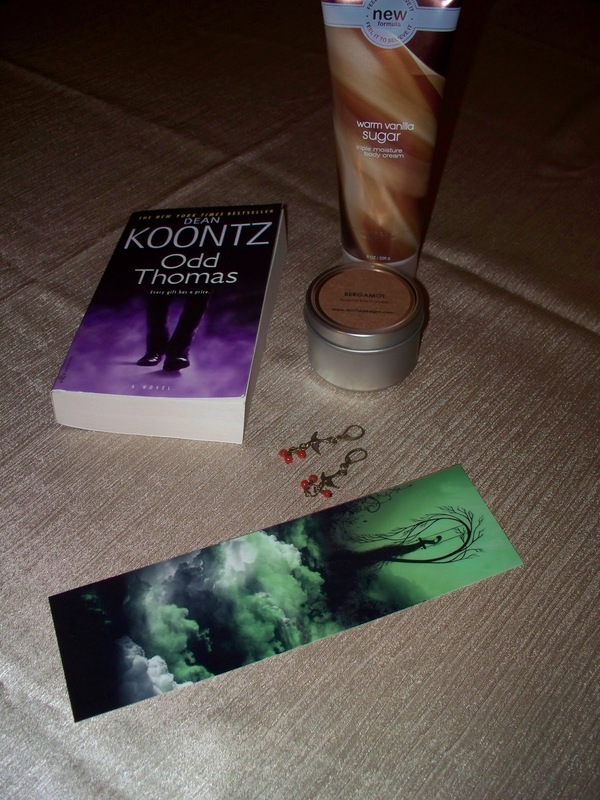 ), pens, mini-clips, a bookmark from Barnes & Noble, and an OPI mini lotion. I’ve been a Dean Koontz fan for years. I even have a signed letter from him. Written to me! This set includes his brand new release, What The Night Knows. This set also includes a hand-made soap from another fellow blogger, Kathryn. You can find her shop here. This soap is Ginger and Cinnamon Olive Oil and it smells divine. I have two pieces of her original art and they’re gorgeous. Also, there is a bookmark from Barnes & Noble and a mini lotion from Bath & Body works. I tried to think of something that would appeal to guys as well as gals….and I struggled. Finally, I thought of the upcoming movie, Cowboys and Aliens. Then, I found this cool looking book at Barnes & Noble. I thought about going with a zombie/western/north-western kind of theme and here it is. 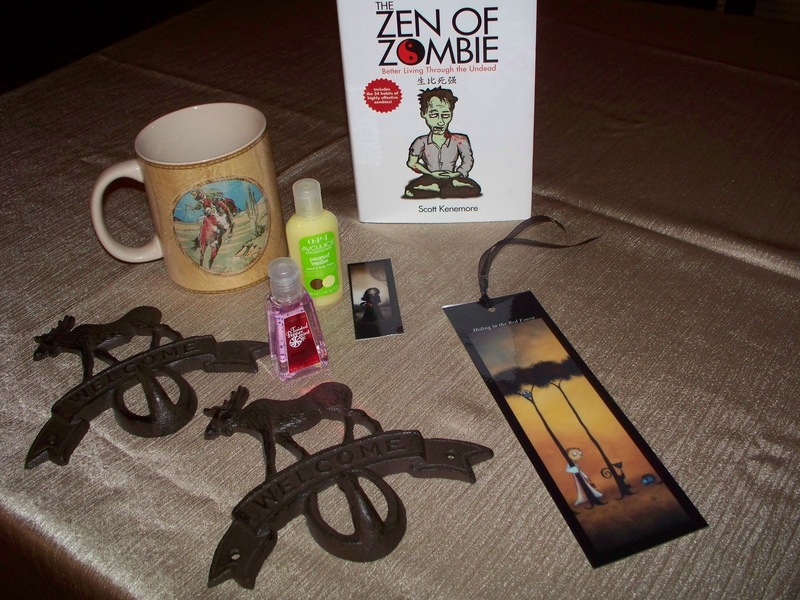 This set includes The Zen of Zombie, a cowboy mug from Hobby Lobby, as well as the two iron moose welcome hooks, a Twisted Peppermint hand sanitizer from Bath & Body Words, a mini OPI lotion, and a Creeper bookmark from Charlene’s etsy shop. There’s also a mini bookmark. 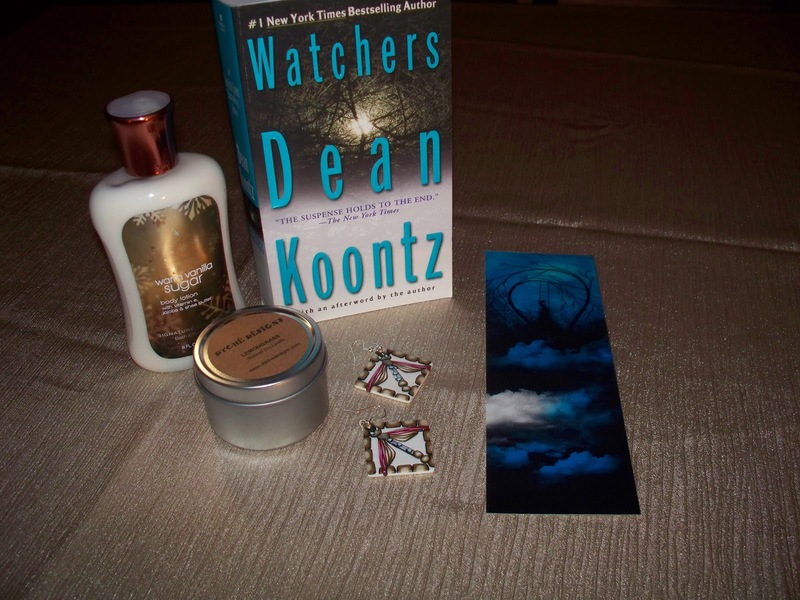 This set includes Koontz’s Odd Thomas, a wonderful book if you haven’t read it. It also includes a pair of earrings created by fellow blogger Nicole Murray. They’re little birds with tiny red beads and they’re absolutely adorable. You can find her shop here. There is also a lotion from Bath & Body Works, a bookmark from Charlene’s daughter’s shop, and a candle from Kathryn’s shop. 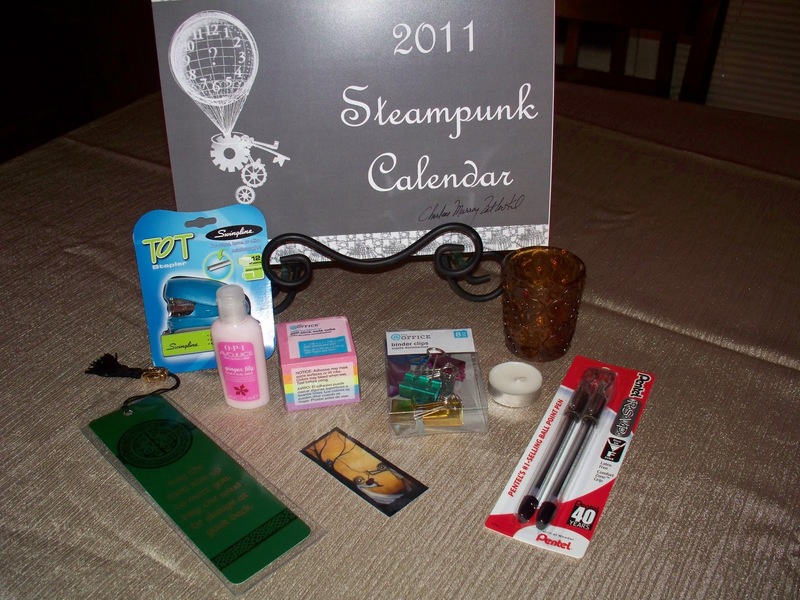 This set includes the Steampunk Calendar and you can see it better here. There is a mini bookmark from Charlene, as well as one from Barnes & Noble. There are mini post-its, a mini stapler, pens, mini clips, a votive holder from Yankee Candle (and a tealight), and a mini lotion from OPI. One of my all time favorite Koontz books, Watchers is in this set. 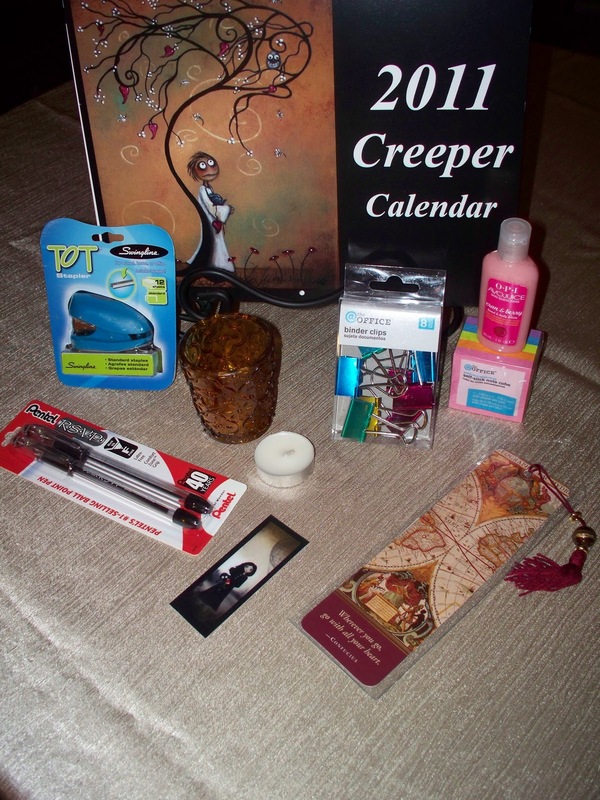 It also includes a candle from Kathryn, a bookmark from Charlene’s daughter’s shop, a lotion from Bath & Body works, and a pair of OOAK handmade earrings from Val. I have several of her pieces, some are custom. These are dragonflies and you can see similar ones here. I call this set the Harry Potter set. Fellow blogger Willliam picked up two CD’s for me. Lenoir Rhyne University, where William is a student, had a Harry Potter week, complete with concerts, guest speakers, and Quidditch games. The two bands that came….well they brought some CD’s to sell. 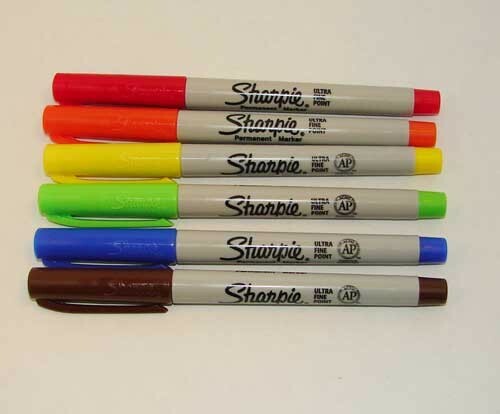 They’re not in the plastic…because they’re signed! This set also includes a CD I picked up at the ResFest. I have an old copy just like it, except this time, the guys used LightScribe and made your copy pretty. It’s called drums and drones. 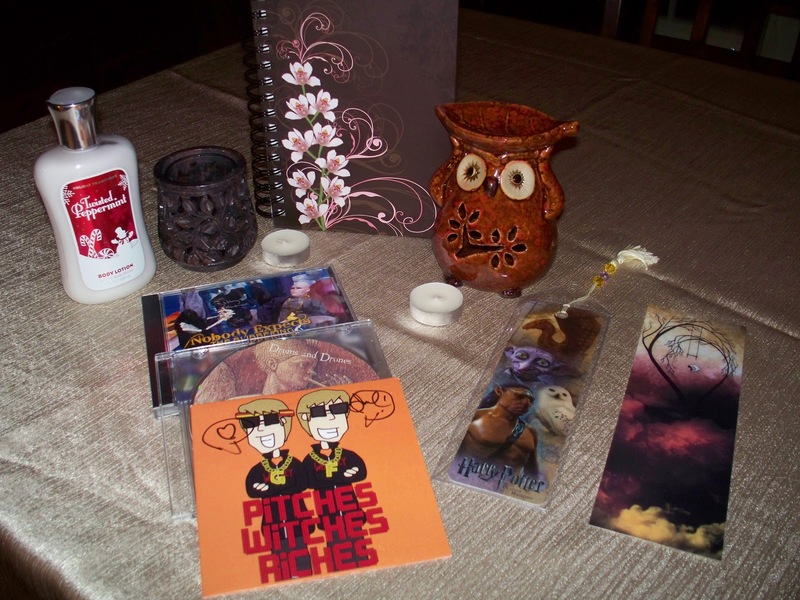 There’s also a journal and a bookmark from Barnes & Noble, a lotion from Bath & Body Works, a votive holder from Yankee Candle and a tart warmer from Kirkland’s (with a tealight for each), and a bookmark from Charnene’s daughter’s shop. 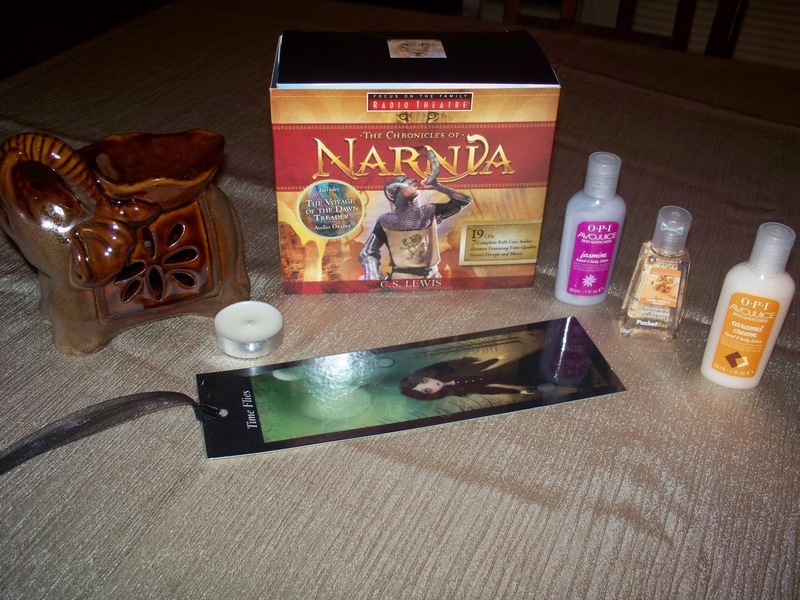 This set includes the Chronicles of Narnia Radio Theater CD’s. All of them. It also has a bookmark from Charlene, a tart warmer from Kirkland’s (and a tealight), 2 mini lotions from OPI and a hand sanitizer from Bath & Body Works. Here are the rules, and they’re pretty simple. You have to be a follower of this blog. No linkage; no tweets; no facebooking; not even any sidebar-ing. Just following. Old followers will have their name counted twice; new followers will have their name counted once…..
Leave a comment telling me which set you prefer. Be sure to leave an email address if it isn’t linked on your blog or if you don’t have a blog. This giveaway will run until January 12th. On the 13th, I will put your names in a box and have the children in my class draw the winners. The winners will be announced on Saturday, the 15th. Well. It’s New Year’s Eve. 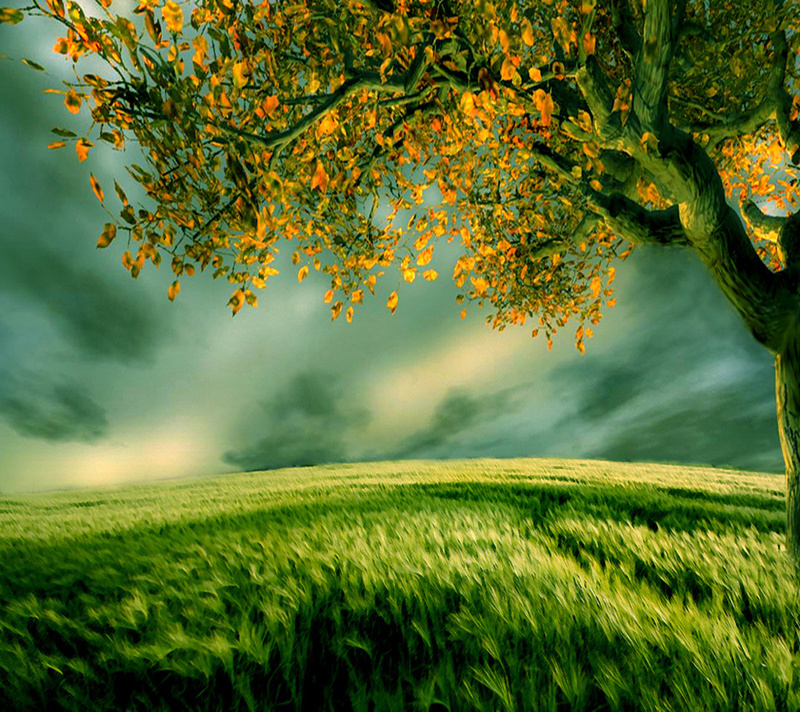 This is traditionally a time of reflection and of looking ahead….. This has been a hard year for me in many ways. Not a bad year, mind you. Just hard…. I’ve had to let go of things, of people, of dreams…..
It’s seemed as if every teeny, tiny thing was an epic battle, no exaggerating. I pinky promise. And my hormones are wreaking havoc on my emotional state. I know what it is, I’m just not ready to face that particular reality. 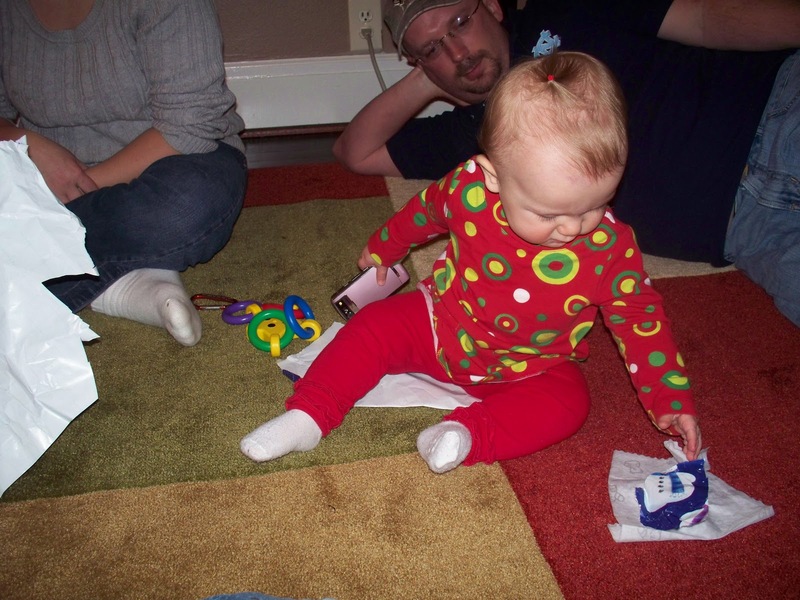 TMI, I know…but I’m looking back here…. One of the hardest things about this year, for me, has been Honey’s jobs. He had been working for a satellite company, which would have him out till whenever, and in all sorts of weather conditions. I hated it and so did he; but we were both thankful that he had a job. Then, he got a job working with his BFF. He absolutely loves it. And he’s not in the weather. But, where before he had three days off every week, he now only has one. And the hours are just as long…. Director’s husband is cancer free. Roo came into our lives. My family is healthy and employed. I’m fortunate enough to love the people I work with and for. My husband loves his job and works with and for great people, too. We paid off a lot of debt. We have a home. And heat. And food. I began writing. I wrote a book (nano). And I met all of you…. That’s not too bad, huh? As for resolutions, I gave those up long ago. They’re exercises in failure. In February, I decided to write. And I have. It was my only goal for the year. This coming year, I’m concentrating on The Follow-Through. That encompasses many things for me. If I can manage to follow-through on at least one thing a day, it will be a success. And success is measured in small victories. I intend to build upon those small victories……I’m going to make success a habit. It only takes twenty-one days for a thing to become a habit, did you know that? 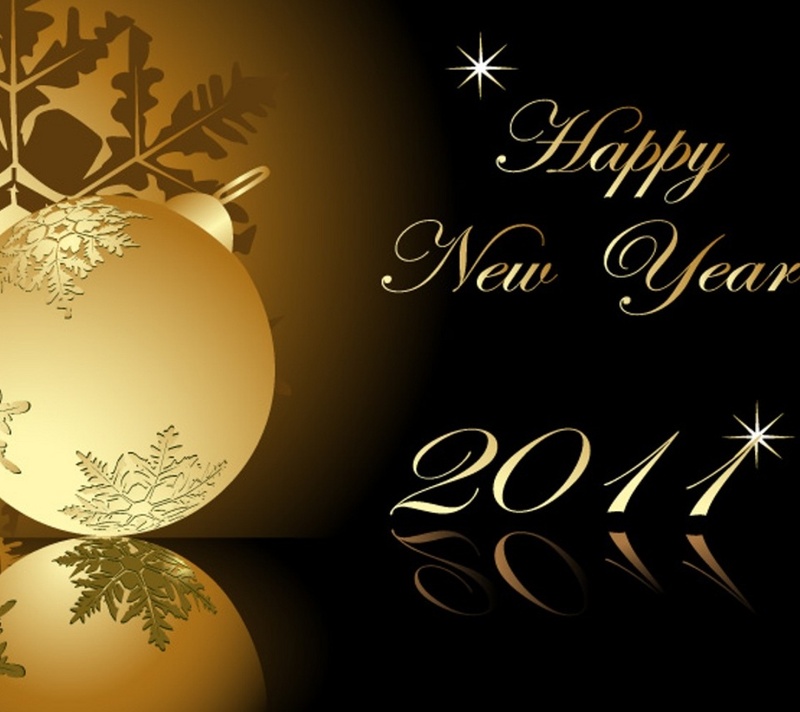 So, for the coming year, I wish for us all the healthy habit of success…. Successful in our letting go of negative things…. Successful in our endeavor to become better selves…. I’ve not put periods at the ends of any of these sentences because they’re open to interpretation. Healing for me may be different from healing for you….and we all have various things in our lives that require courage…. I am being courageous (more than you know) in hoping these things. I want them for all of you, but hoping them for myself…..that’s a big deal. And for me, it will be all about The Follow-Through…..and the key will be not focusing on all these things I’ve listed or looking at the big picture. It will be about focusing on one thing at a time; doing it; completing it; and moving to the next thing….and success will simply be the natural by-product…. I hope for all of you that this new year will hold many successes, in many forms, and so abundantly that you will have to begin heaping it onto others…..and still have so much left over that you can just wallow in it from time to time…. >I have a teeny weeny confession to make. I’m one of those people who can get up to some weird stuff when they’re bored. For the past couple days, I’ve been fighting off a terrible cold. 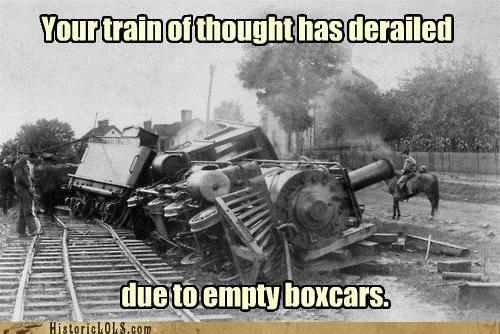 Today, I needed to run some errands but didn’t because of a sinus headache. Thankfully, it’s nearly gone now, but that’s not the point here. Do any of you remember these commercials? Don’t raise your hands! If you can, like me, you’re probably old enough to lie about your age and I don’t want to out you….. Anyway, not in the mood to clean or read, but feeling a little munchy, I decided to experiment. Since we have some rare Hershey Kisses in the house (not rare as in worth some money, but rare as in we never buy them), I thought I’d see what they would taste like dipped in some Jif. Know what? It’s not too bad. Still, I much prefer Reese’s Cups. That’s my mischief for the day. January 3 is my mom’s birthday. She would be 68 this coming Monday. If baking is allowed in Heaven, I’m sure everyone will be clamoring for her secret recipe red velvet cake….. Anyway, what I wanted to tell you all is this: in honor of her birthday, on the 3rd, I will be making an announcement. And you won’t want to miss it. I know it’s gonna be a Monday and some of us will be getting back into the swing of things and might miss it. That’s why I wanted to give everyone a head’s-up. And now I have. 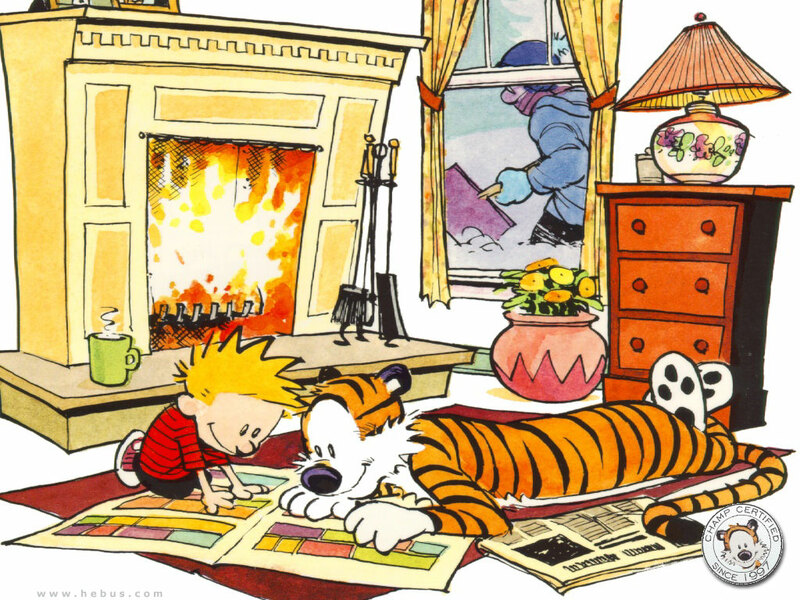 My favorite gift this Christmas was spending time with my family. Honey had the WHOLE weekend off (which is unheard of), and we managed to work out time to get together with my brother and my nephew, and their wives. And with Squirmy, of course. This little birdhouse looked really cool but the flash kept illuminating the roof inside. The first time I saw it, I looked at the camera, then the house, trying to see what was blocking the entrance! 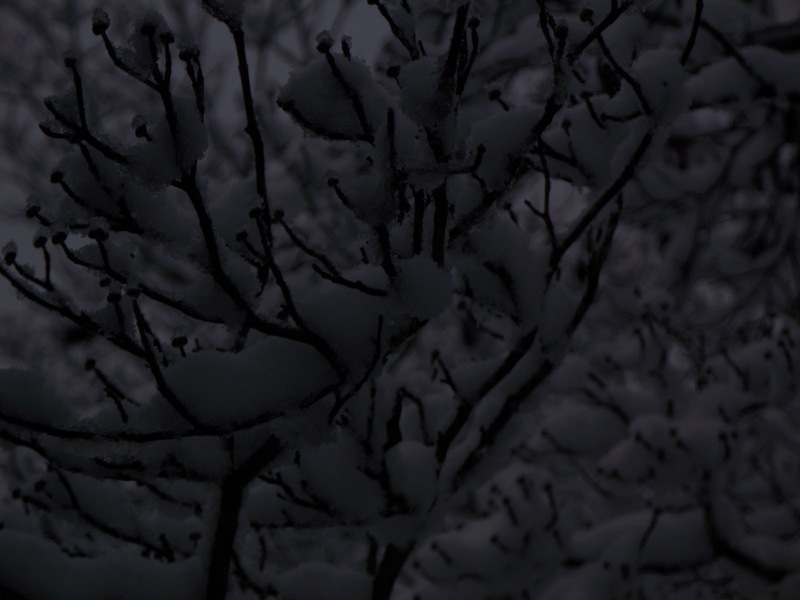 I tried to get some neat shots by standing next to the trees and looking up. 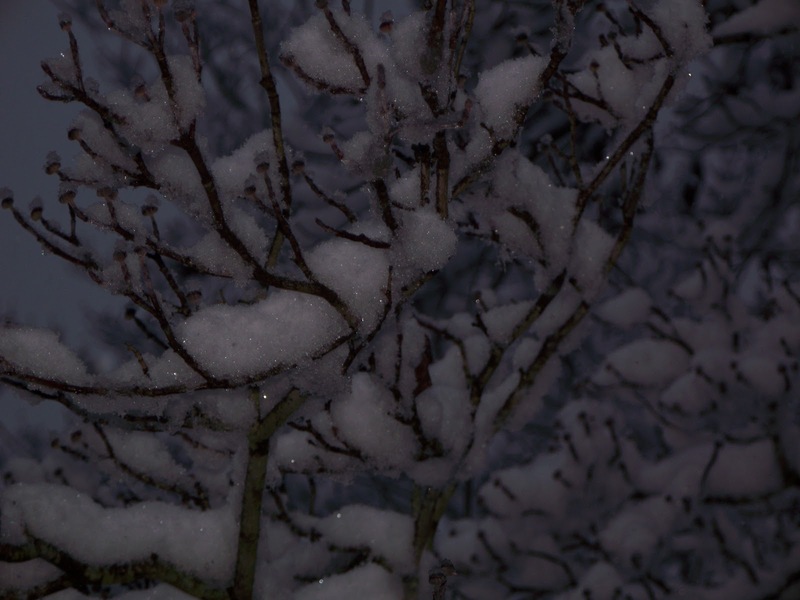 The snow and the lens refused to cooperate with each other….. 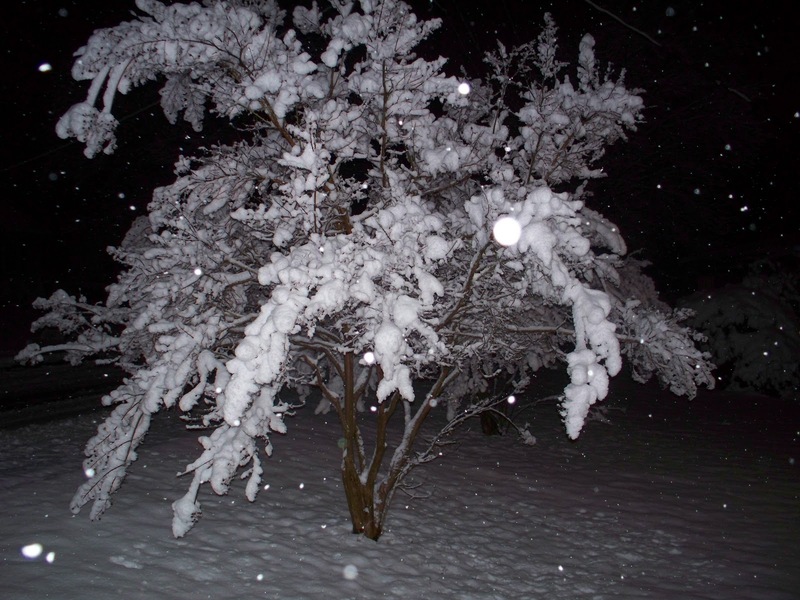 It wasn’t terribly dark at all when I took this tree shot…..the flash just made it look that way. 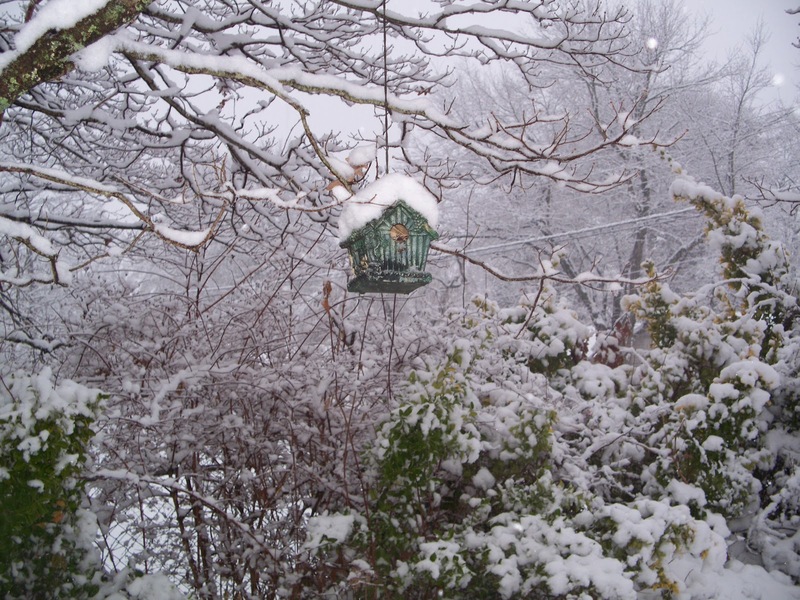 We ended up with just over eight inches here…. Even if it was beautiful! >Seriously?!!! It’s Nearly Tuesday?!!! How’d That Happen?!!!!!!! >Wow! 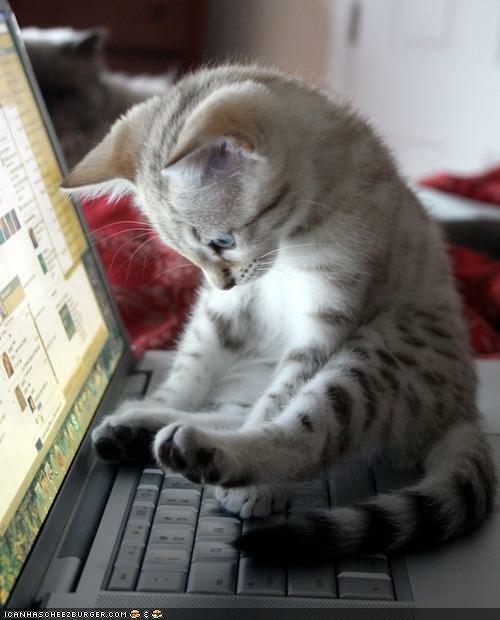 I’m amazed that I haven’t experienced internet withdrawal!!! 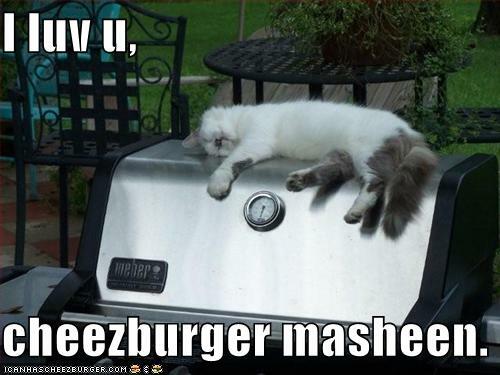 That’s how busy and tired I’ve been, I suppose…. I can’t even remember when I was on here last. Not to post, but to visit. Dang! I think I slept all day on Friday and again on Sunday. 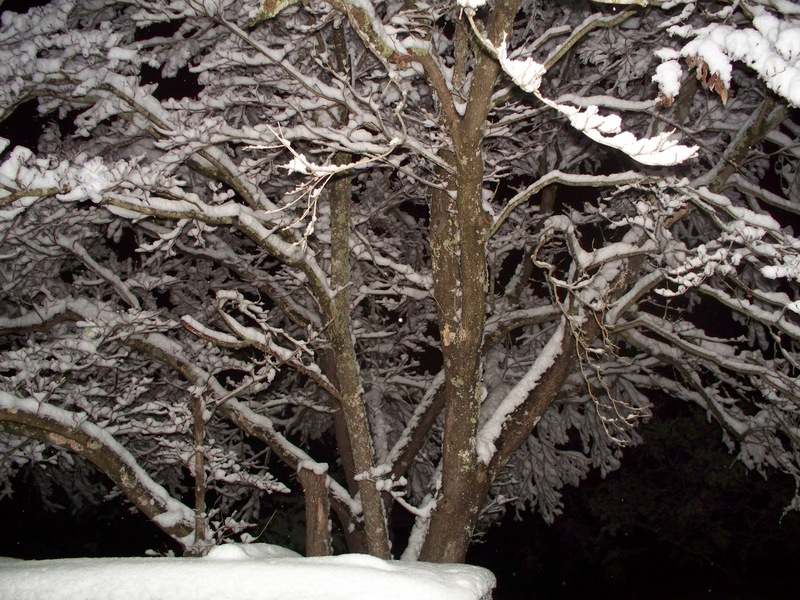 I’ve felt exhausted lately and so has everyone I’ve talked to…..
We’d planned to go to Asheville Friday morning for Honey’s side of Christmas and get back and do my side in the evening. 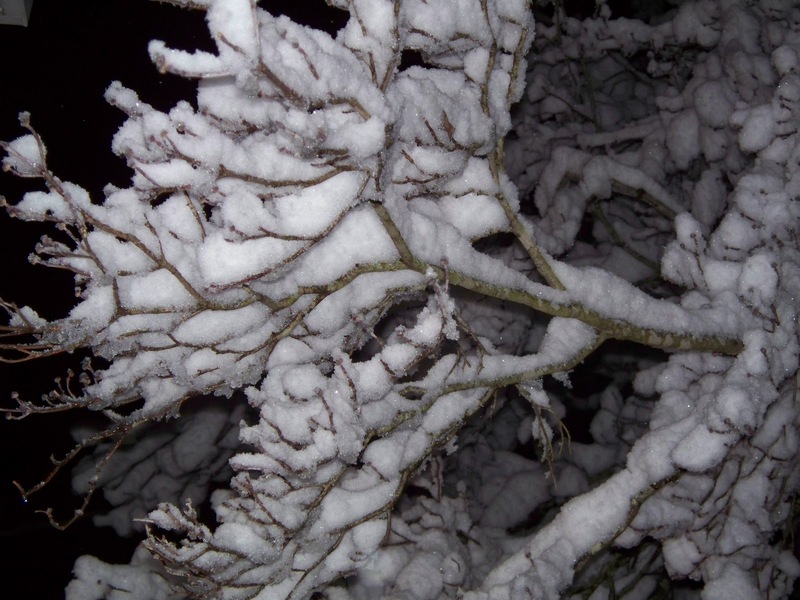 The snow, however, changed those plans. 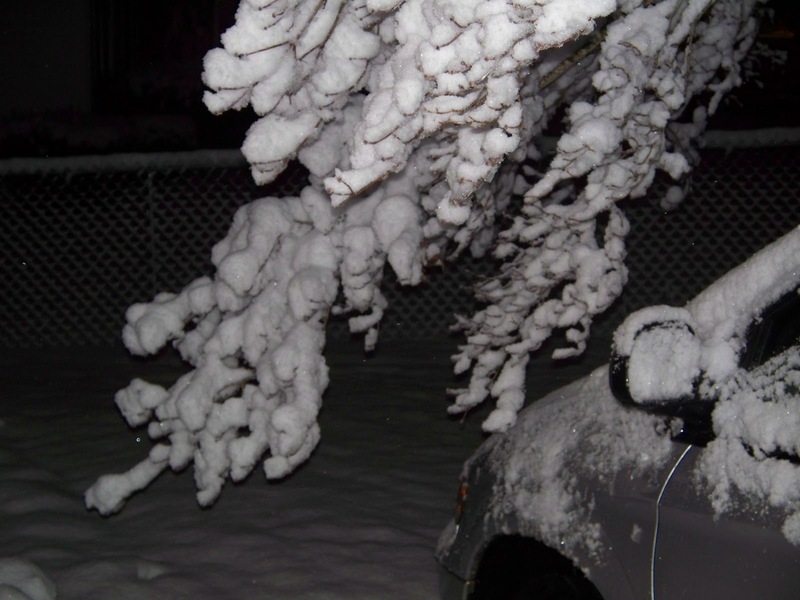 We still did my side, though I was terribly worried about everyone traveling in the snowy conditions. I suppose I forgot who I was related to…..they regularly drive in all sorts of conditions and over a variety of terrains. For fun. Duh…. 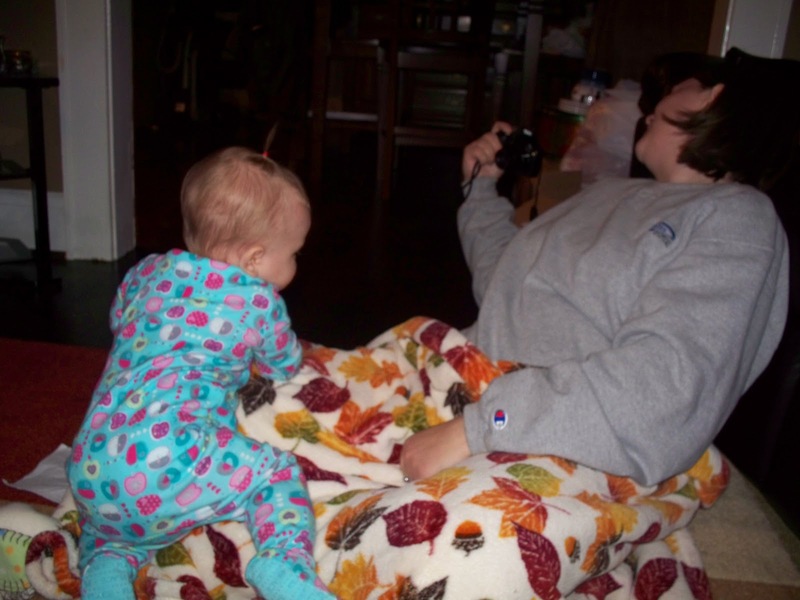 ….later in her jammies and Mommy trying to get a pic…. 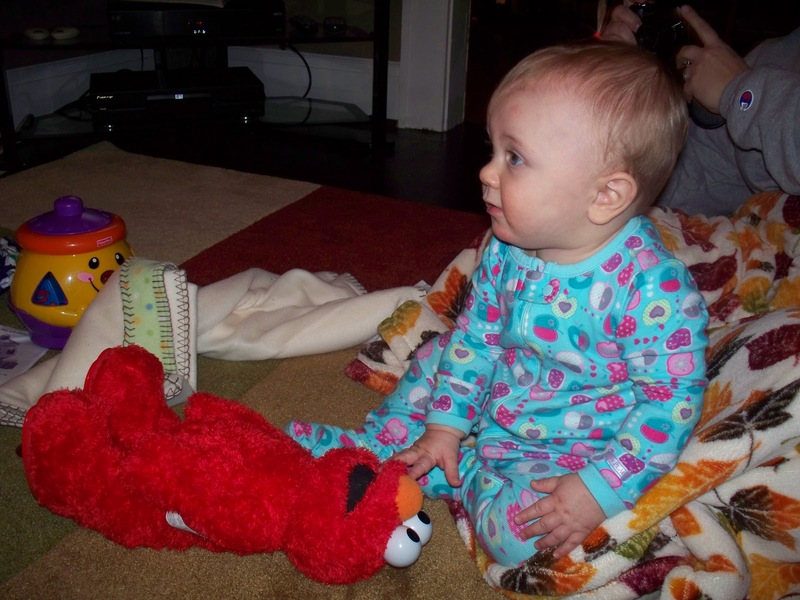 …..exploring Uncle Honey’s tickle me Elmo (a funny b-day gift from me), and getting a little tired…. 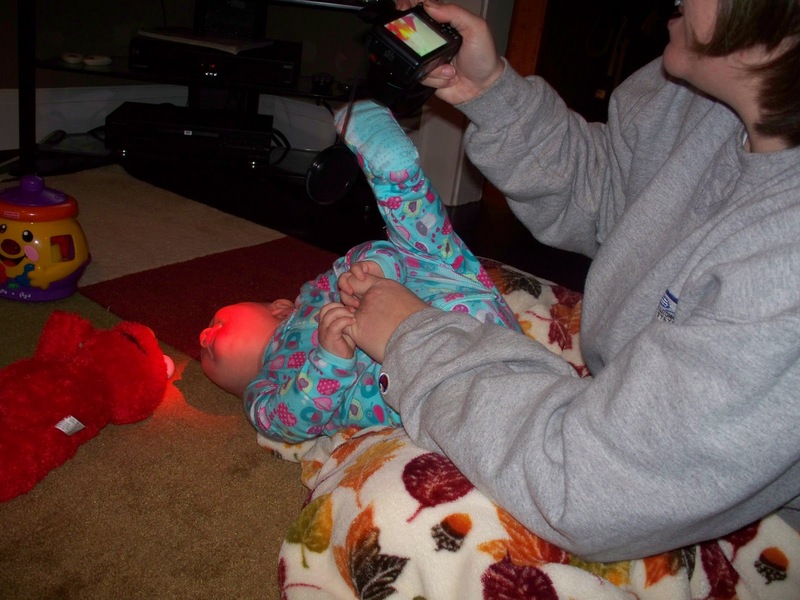 …..laughing while Mommy and Auntie snap some pics…. 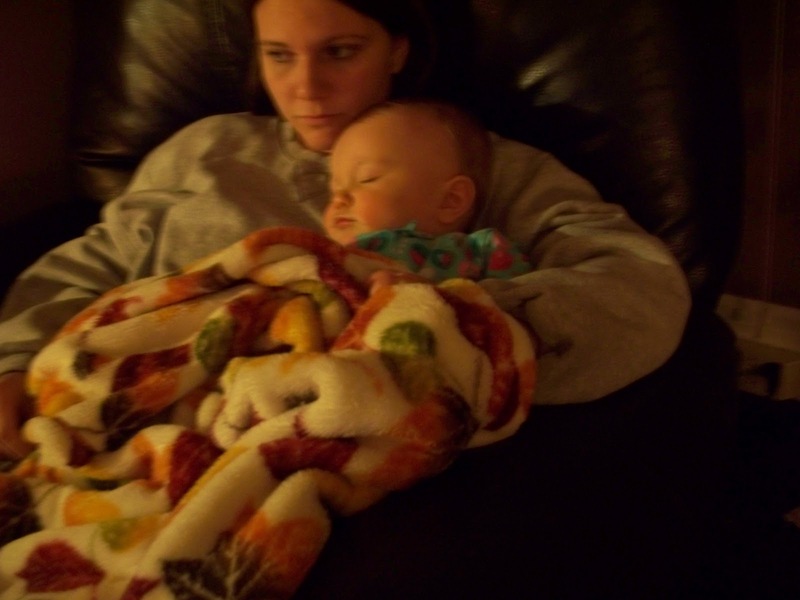 …..tuckered out and snuggling with Mommy….. I know, I’m being a bit indulgent with the pics of my baby niece. 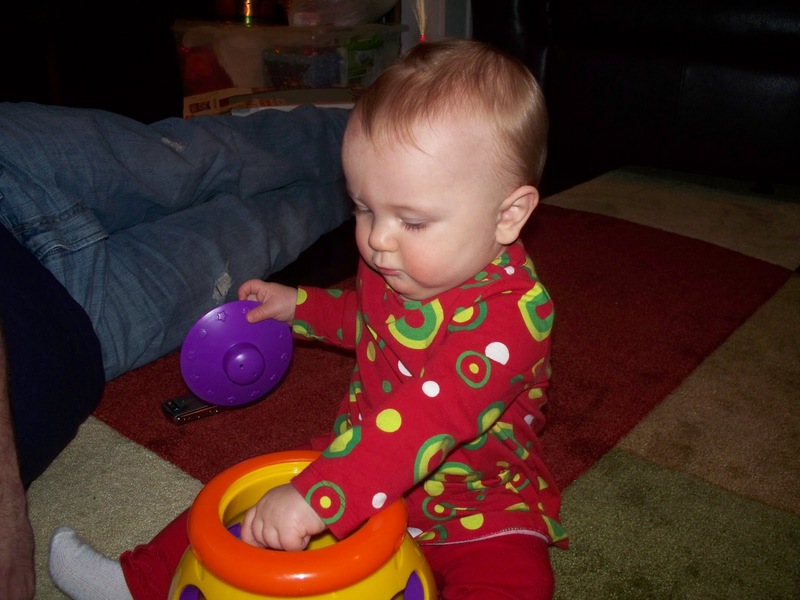 Still, they’re the first ones I’ve posted on here, with Mommy’s permission, of course, so…. It was a very relaxed time, and lots of fun. All our crazy schedules make it difficult to find time to spend together, but I cherish the times it works out for us.